This site is the online hub for public information and involvement related to the Apache Leap Special Management Area Management Plan and Environmental Assessment (EA). 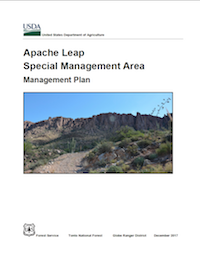 In December 2017, the Tonto National Forest finalized development of a management plan for the Apache Leap Special Management Area (Apache Leap SMA). This plan establishes a comprehensive framework for managing the Apache Leap SMA as specified in the Carl Levin and Howard P. “Buck” McKeon National Defense Authorization Act (NDAA) for Fiscal Year 2015. The NDAA directed the Forest Service to prepare a management plan for the Apache Leap SMA in consultation with affected Indian tribes, the Town of Superior, Resolution Copper Mining, LLC (Resolution Copper), and interested members of the public. Direction contained in this plan also will be incorporated into the 1985 Tonto National Forest Land and Resource Management Plan (forest plan). NDAA Section 3003 also includes direction for the exchange of the approximately 142-acre Apache Leap South End Parcel, presently owned by Resolution Copper, to the Forest Service. This parcel will be added to an existing area of the Tonto National Forest (about 697 acres) to form the approximately 839-acre Apache Leap SMA. The area covered by this plan lies within the administrative boundaries of the Globe Ranger District of the Tonto National Forest in Pinal County, Arizona. The Apache Leap SMA is located on the eastern edge of the Town of Superior, Arizona. The Apache Leap SMA is named after its signature feature, an escarpment of sheer cliff faces, hoodoos, and buttresses known as “Apache Leap.” Upon completion of the land exchange outlined in Section 3003, the Apache Leap SMA will include only federal lands. The management plan is available to download or view on this project website - Management Plan.